We go through a lot of socks in this house! Especially Mike -- he's a Land Surveyor -- and socks don't last long for him. It's a bit frustrating, too, as end up going to half a dozen places trying to find the "right" socks for Mike: work, athletic, casual. It's tiresome. For me, it's been a pain in the neck because I prefer crew socks and I have a really hard time finding the one's I like and want. Not anymore, thank goodness! I've discovered Socks4Life! Socks4Life is an on-line one stop shop for socks. EVERY TYPE OF SOCK! 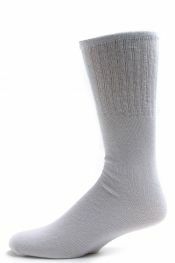 There are Men's Socks: Tube, Crew, Thermal, Athletic, Diabetic, Wool, Cotton. Everything the man in your life needs to keep his feet comfortable, warm, and happy! I ordered the All Sport Men's Tube Socks for Mike. A 6-pair package is on sale right now for only $8.95! Always a classic, these tube socks are step above others. With a full cushioned support on the bottom and strong cotton blend, these are not your normal tube socks. Great for walking, sports, or every day wear. Each package contains 6 pairs of white tube socks. Made in the USA. These are perfect for Mike. He wears boots at work -- it's best for the conditions, terrain, and weather he's in daily. However, Socks4Life also carries Women's Socks, too! You'll find slippers, slouches, dress, casual, knee-socks, liners, novelties... and everything else under the sun! I ordered the American Made Women's Purple Heel and Toe Crew Socks for myself. Love that touch of purple! :) The 3-pair pack is on sale for just $7.95 now! 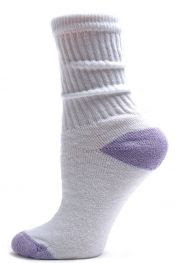 Our American Made Women's Purple Heel and Toe Crew Socks come with a full cushioned bottom, reciprocated heel and toe for a better fit, and a welted top. Made in the USA. These crews are perfect for me. The don't slip down inside my shoes and they don't "rub" the tops of my toes. They also keep my toes nice and warm -- a great plus for the damp Georgia Winters. Oh! I don't want to forget the kids! Socks4Life carries an amazing selection of Kid's Socks as well -- in every style, colour, and size! You won't have wander around from store to store (on-line or in town) ever again. It's all here for you and your whole family at Socks4Life. The generous folks at Socks4Life have offered one of my oh-so-lucky readers the chance to experience their on-line store by giving them a $25 Gift Card! How cool is that? I received a $25 GC to facilitate this review (used to purchased the socks mentioned above). I was under no obligation to write a review. I received no monetary compensation. The opinions expressed herein are my own and based on my own use of and experience with the item. I Don't see the rafflecopter form coming up. I'd love the Women's Pastel Assorted socks. I would get the pom pom sock. Don't you remember pom pom socks from summer camp! I would probably get the women's pastel quarter socks. I like the Christmas Morning Socks! I would love some of the thermal socks! I would purchase the womans pastel heel & toe quarter socks. I would like these black socks for my son. I like the Silhouette Solid Colored Liner Socks! I would choose the Get Active Women's Bright Stripe Low Cut Socks. I like the Women's Royal Blue Pom Pom socks. These will be on my list. Gotta get the most socks for my money. I don't ever have socks no matter how often I buy them. Lol. I have a teenager so that makes sense. I'd like the asst womens cotton slouch socks. I would get women's dress socks http://www.socks4life.com/yelete-womens-dark-solid-color-knee-socks-1-pair.html as soon as I switch to loafers in fall I realize I have no dress socks! I really like how these socks look they are so cute. First I would buy some non-slip/non-skid Stripped Slipper Socks for my 88 year old Mom and use the rest to follow your advice and get some quality new socks for my Honey/Hubby - who really really NEEDS new socks!